The Voice of Vietnam (VOV), in cooperation with the Ministry of Culture, Sports and Tourism, has recently launched Vietnam Journey, a TV channel on Vietnam’s tourism and culture. The new channel aims to implement the government’s Decree No. 08 on developing tourism into a spearhead economic sector and Decree No. 103 on building specialized channels to promote the country’s culture and tourism, according to Mr. Nguyen The Ky, Director of VOV. Vietnam Journey is the first multi-platform interactive TV channel in the country. With interactive technology, viewers can directly participate in the programs and shows and interact with the MC and other viewers through smartphones or smart TVs. Outstanding and attractive programs on Vietnam Journey include Vietnam’s endless beauty, Vietnamese culture space, I travel, Following the conical hat, and On every kilometer. Vietnam Journey officially broadcasts in HD 24/7 on VTV Cab, SCTV, VTC, Mobi TV, FPT, My TV, and Next Media. It also operates via http://truyenhinhdulich.vn. The app for Vietnam Journey is available on ISO and Android and allows users to interact directly with the program. For example, they can connect directly to reporters who are reporting on a certain issue by clicking the “video call” function. The app also provides information on destinations in Vietnam, travel guides, hotel reservations, air ticket bookings, and photo sharing. At each destination, visitors can also be updated on the traffic, the weather, must-try cuisine, and tourism products in localities. It will be soon available in English, Russian, Japanese and Korean. 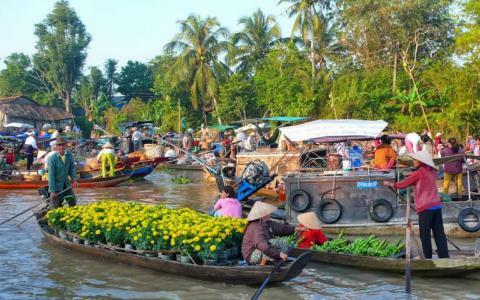 The number of foreign holidaymakers to Vietnam in the first eleven months of 2018 was estimated at 14.1 million, a 21.3 per cent increase year-on-year, according to the Vietnam National Administration of Tourism (VNAT). The number of domestic visitors in the same period was 73.9 million.